Eating behavior has fascinated me for years. Maybe because of my Italian heritage and the tendency to “cook enough for the army, the navy and the marines” as my mom would say…..coupled with my discovery of the research on “restrained eating” and learning about the link between dieting and binge eating. Added to my years of working with people with eating disorders and weight concerns, I have a great appreciation for the complexity of eating, food, and why people do what they do. So I love when people tell me stories about food and eating. Last week at work one of my co-workers told me a story about a family dinner and how something a relative (great aunt) said that kind of bothered her. It was a celebration and cake was being served. My friend, her son and her daughter were enjoying a piece of cake at the dining room table while this aunt sat on the couch watching. “Look at you all, stuffing your faces!”she said in a way that was kind of negative, as if she were witnessing bad behavior, or behavior to be ashamed of. My friend went on to tell me about this aunt who appeared to be criticizing them for eating cake. Apparently this person is someone who always resists the dessert…..she “does not eat sweets”. She has “willpower”. And she seems to look down on those who give in. But then, here is the weird part, the question my friend had: she refuses to take dessert EVER…..but then eventually, every single time, after shaming everyone else, sneaks back for “just a sliver”. OH! I knew exactly who my friend was talking about. She sounds like “The Sliver People”, I said. We both burst out laughing, describing what we see when people try not to eat something they really want but for some reason don’t allow themselves to have. After a good amount of giggling at the term we just coined, I went on to share my theories of The Sliver People. Now remember, these are just my theories (which are influenced by research on cognitive restraint and dieting behavior as well as what lots of my patients have described to me about the way they think and feel about food). They have a “good food-bad food” mind set. Sweets are bad, dessert is bad, cake is bad, so nobody should be eating it. If you eat “bad” food, then you, by association are being “bad”. You have no “willpower”. You are weak. My Response: if you like it, it is GOOD. If you have cake for breakfast, lunch and dinner, you won’t feel too good. It’s all about balance and “listening to your body”. If you want something sweet and don’t eat something sweet, you will likely be thinking about food all day. I would recommend eating that darn piece of cake and going about your day. 2. They think cake (substitute sweets, desserts, “bad” food) makes you fat. 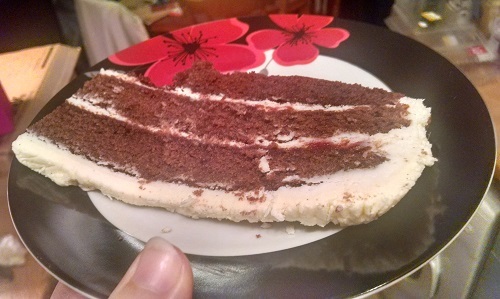 Magically, one piece of cake can add gobs of weight. My Response: the scientific fact is that one average piece of cake may have a few hundred calories (except my sister-in-law Michelle’s Mocha Marsh mellow 90 million layer cake she enters into baking contests which she manages to cram in a bit more melted butter and cream I am guessing that makes her a champion baker)….anyway, it takes much more than a piece of cake or one dessert to have any effect on weight, even Michelle’s. When you eat more calories than your body needs, it knows what to do. You don’t have to count. Think about it. When you eat a bigger meal than normal, something very strange happens: you no longer feel hungry, imagine that. You can go longer than an hour without thinking about food. So if you eat the cake and it is more than you normally eat, your appetite on its own will keep you in balance (if you learn to listen and trust it). Not easy for some people. 3. They have been dieting most of their lives. They are on a diet still. Cake is not on the diet. My Response: when people “go on a diet” and eat only certain foods while eliminating others, we know they eventually have to “go off” the diet. Dieting and food restriction lead to food obsession and disordered eating, often binge eating. When dieters give in and have even “just a slice” feelings of guilt often follow. That is why restrained eating and dieting often lead to depression (in addition to the negative effect of starvation and inadequate energy intake on our brains and mood). I know I will never convince people to stop “dieting” or looking for that magical eating plan that will transform their bodies and their lives….but I won’t stop trying. Instead, if you focus on “healthy eating” and living, then having a piece of cake for dessert at a family celebration does not disrupt anything. It just adds to life’s enjoyment and moments we should be cherishing, creating memories together, savoring every single thing that is good…and I call that “healthy”. 4. They really aren’t hungry,but want to taste it. Their belly is full, but they know they won’t get this chance again (how often do you get a chance to try an award winning 9 million layer cake?). My Response: I think it is “normal” eating to listen to your body, and if you know you can’t fit an entire piece of cake comfortably into your belly but want a “sliver”, it’s not a big deal. Chances are the person who takes just a bite because they want to taste it are probably not even noticing what everyone else is eating. They certainly are not being judgmental about anyone who decides to eat an entire piece. They are just eating what they want and not what they don’t want. Maybe they may take a piece “to go”. There is nothing wrong with that, honoring your body and staying in tune with it is something we all should be working on, that is if feeling good is your goal. Are you one of the “Sliver People”? If so, do you recognize yourself in any of these descriptions? Remember, this is not meant to be a judgement of people who don’t take an entire piece of cake. It is meant to make us all aware of how we have been influenced by a culture that values thinness and weight loss and dieting at the expense of the true meaning of life. To cherish family, friends and celebrate all that we have, all of our blessings as much as we can while we can (if you ask me). To be thankful for all of it, every single day. To miss out because of fears of gaining weight, well, that is just sad. Oh, and please don’t judge me because I only eat the frosting. Your Child’s Chubby Belly: Should You Worry? I love this term and can identify exactly who you mean. I agree with your dislike of ‘the judgement’, as a society we do far too much of this. thank you Ruth! I also meant to describe how typically people tend to eat much more than one sliver, but unfortunately never truly savoring and enjoying what could have been just one normal dessert…yes, the judgement is everywhere! !